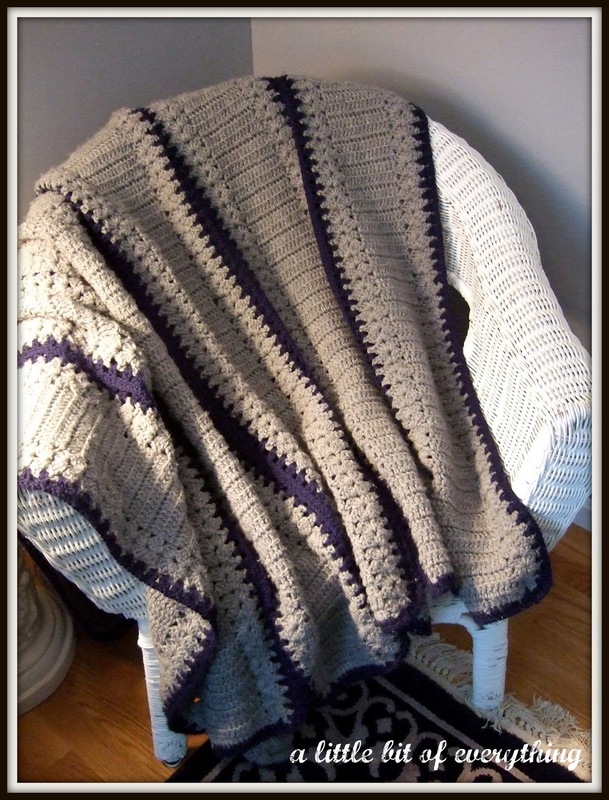 This afghan measures 48" x 54" when completed and uses 4 ply worsted weight yarn and size G crochet hook. It is worked in six strips and then these are stitched together along the long edges. It is a good project for taking along with you since the strips are not cumbersome to transport. The pattern, "Park Avenue", can be found in "Red Heart Afghans and Crochet Classics" on amazon.com and is considered "easy" and supposedly their "most requested pattern of all time". That is lovely. I love the colors you used. I need to start crocheting again! That is lovely and would be great to snuggle up with. If you have a few spare minutes please pop by and say Hi. I am also crocheting an afghan in very similar colors. I like this pattern and it looks so cozy. I'm a very late hopper from Mommy's Sweet Blog Design, but a new follower! I love your "little bit of everything" concept--that's what life is, after all! Hope to see you on my blog sometime! Is that considered a "mile a minute" afghan? It's very nice, love the neutral tones. Thanks for joing our hop on Mommys Online Garage Sale. I am your newest follower. It turned out beautiful. I'm your newest follower. It would be great if you could stop by my blog Monday and add your project to The More The Merrier Link Party. Great Afghan - looks all warm and cosy! Just popped by to say a big thank you for stopping by and for a linking up on my weekend creation blog hop at wordsinsync.blogspot.com. Boy, I sure could have used a nice warm afghan like that one this winter. Hopefully, we are beyond the really cold weather now. Thanks for linking to the party. I would love to have you join me this Friday for "Funny Faux Pas Follies," as well. Get the details by clicking the party button in my sidebar. I would love it if you could stop by my very first blog hop debuting today and share this post!